In May, 2011 I began to write and to publish the articles that, almost weekly, you may have read during these six years, which I have tried to make various. With elements of thought, on the art world and on artistic life; also with elements of information and knowledge on arts in general, and on engraving and the engravers in particular. Only you readers who followed me faithfully will be able to judge if my aim has been reached. I am satisfied of it and happy generally speaking. I spent good time, reading documents and writing, but also I have especially enjoyed the suggestions and comments that you have sent for me. I am enormously grateful to you underwriters and to all readers of the articles of this Blog. I have learnt a lot from you and you have helped me to grow indeed. The compilation has been important. During these six years I have published altogether 1.083 articles (in 4 different linguistic versions: Spanish, Catalan, French and English). In English, concretely, I have published 224. Wow, my God!! No need to say that writing four articles weekly in four different languages (sometimes common articles, but more often on different topics) requires a discipline and efforts that are difficult, normally, to sustain along time. Provided that I am not at all a super man and that I have diverse centers of interest, this performance has implied a constant endurance test, which only my tenacity (or stubbornness) allowed me to achieve. Now, I think that the moment has come to breath somehow. 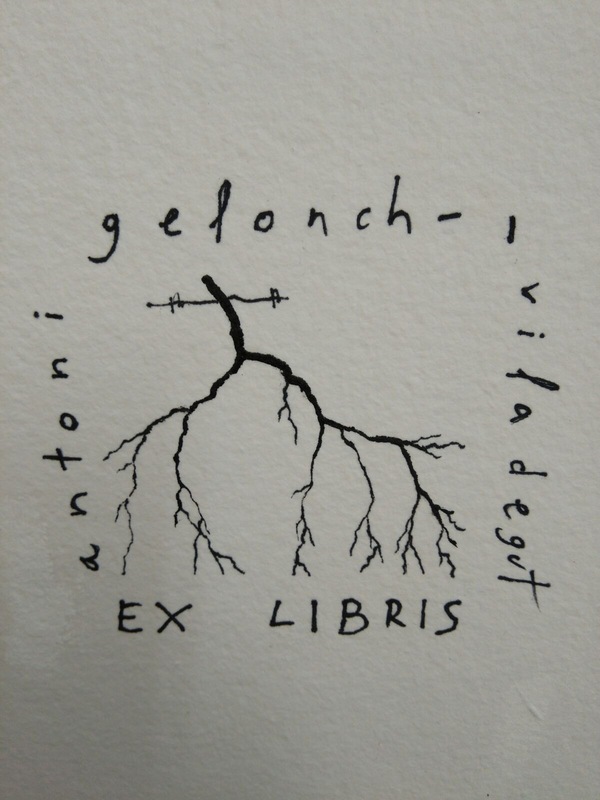 For the Collection, new and stimulating perspectives have come up: diverse exhibitions on their way, or already in very advanced preparations (including one great exhibition), publishing projects that please me, also launching a publishing house of graphical work. Among other initiatives, it will structure and fill my activity in this area of art and of collecting, which – and it is convenient to me- is one of the cornerstones of my life. As I am limited, I can do well only what I like, and if I dedicate the sufficient time to it. Imposing me hard obligations makes no sense. Then, it seems to me that I should moderate the pace of the articles to a fortnight periodicity. I hope that they will continue to catch your interest and that we’ll keep on this writer-reader relation for a long time. 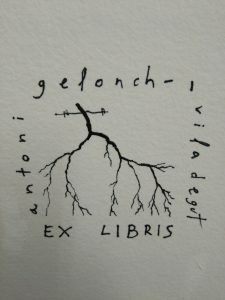 As a sign of my gratefulness, please find attached the exlibris that the artist Joanpere Massana has realized on my request. Taking root in the land we grow up… together and breathing.